Belleplain State Forest | JORBA - You Dig? Be aware that between Memorial and Labor Day Weekends, Belleplain State Forest charges a daily entry fee for vehicles driving into the recreation area (camping and swimming areas). The beginning of the mountain bike trail starts within this area, so driving past the fee collection booth will require one to pay that fee. However, there are alternatives to avoid this fee. You can ride your bike in free of charge. You can park at the office and ride the North Shore Trail, right on the Goose Kill Trail to the beginning of the mountain bike trail. It will add 1 mile to the ride each way. You can park at numerous locations where the trail comes close to Champion Rd, Cedar Bridge Rd, New Bridge Rd or Tom Fields Rd and ride from there. 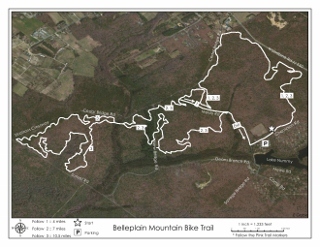 The Belleplain Single Track (BST) mountain bike trail was designed to provide recreational opportunities for various levels of bike riding expertise. A single track trail is a narrow riding path for one bike at a time and may have various obstacles to navigate. The route begins and ends beside the ballfield pavilion just past the Lake Nummy parking area. Follow the pink-marked stakes which further designate three routes - 1, 2 or 3. The trail is meant to be ridden one way with more technical and longer distances available if you follow routes 2 or 3. Route 1 is designed for beginner riders. The route follows established fire cuts and dirt trails as well as new routes thru the woods. The #1 route separates from #2 and #3 at mile 3.3 and returns to the parking area. Routes 2 and 3 subsequently become more technical. Route #2 is the most technical with a challenging segment thru a thick canopy of mountain laurel. Other features include sections thru mature and pole-sized white pine. There are logs to ride over with bail out options. Routes 2 and 3 divide at mile 4.3 with #3 crossing the wetlands via the East Creek Trail before embarking on 3.5 miles in more open woodlands. Route 3 returns onto the East Creek Trail to re-cross the wetlands where the route rejoins #2. The trail will be spongy but will pack down the more it is ridden. The BST is available for mountain bikers, hikers, or bird watchers for general enjoyment. To maintain the course, the Belleplain Trail Users Group has been established. Contact the Belleplain office if you wish to participate in trail maintenance. Many individuals were involved in efforts to establish the BST, including representatives from Belleplain State Forest, South Jersey Wheelmen, Jersey Off Road Bicycle Association, International Mountain Bicycling Association, interested volunteers and support from Beacon Cycling and Fitness, KITnBOB’S Bicycle Shop, Mojo Bicycle Shop, Tuckahoe Bike Shop, and Randy’s General Store and Bike Shop. Please enjoy the trail. Helmets are mandatory for children under the age of 17. Helmets and eye protection are recommended for safety purposes for all riders.